We are so excited to get started with another fabulous Brides Up North exhibition season… and we’ve worked so hard planning and prepping here at Brides Up North HQ this summer that we are sure its going to be our best one yet! You can view the full schedule of events – spanning three regions over three months – by clicking here. You can use our brand new drop down menu to browse, select the event of your choice, pre-register for free entry and your VIP goody bag and pop the date in your diary. You can even register for more than one event if you like – each is very different and we’ve made sure that there is something to delight everyone! We don’t just work with any old venues or suppliers. Our venue portfolio is carefully managed to offer our readers choice and quality, and our exhibitors are handpicked. You’ll leave our events excited and inspired (and maybe a little poorer – but happier)! We promise you that. Our season starts in style at Hilltop Country House in Cheshire on 14th September and – did you see the beautiful wedding I featured on the blog this morning? – you have to see this place for yourselves, but for now, I want to tell you all about our biggest event of the season, and make sure its marked in your planner in indelible ink. 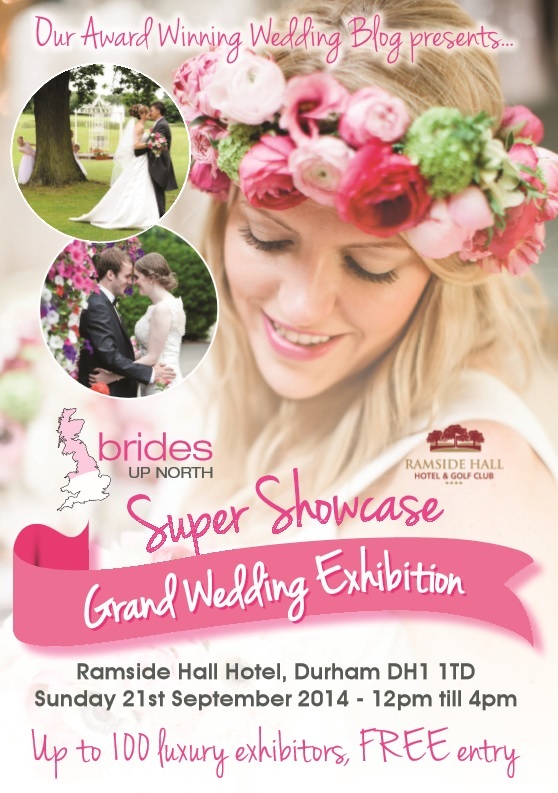 If you’re still looking for anything at all for your big day, you need to be at our Brides Up North Super Showcase Grand Wedding Exhibition on Sunday 21st September 2014. Any luxury supplier worth their sequins is going to be there! Doors open at 12pm till 4pm, and it’s free entry for you and all your guests. Pre-registered brides will also get to take home a VIP goody bag stuffed with glossy mags, treats from our sponsors and pressies from Brides Up North. This is officially the largest free entry bridal event in the North East! With up to 100 exhibitors we’ve got all the details for your big day covered beautifully. To pre-register for a free Brides Up North VIP Bride-To-Be Goody Bag (stuffed with treats and glossy mags) and FREE ENTRY, fill in your details below. You can collect your VIP Bride-To-Be Goody Bag upon entry to the Luxury Wedding Exhibition. Only the bride need register for larger groups. 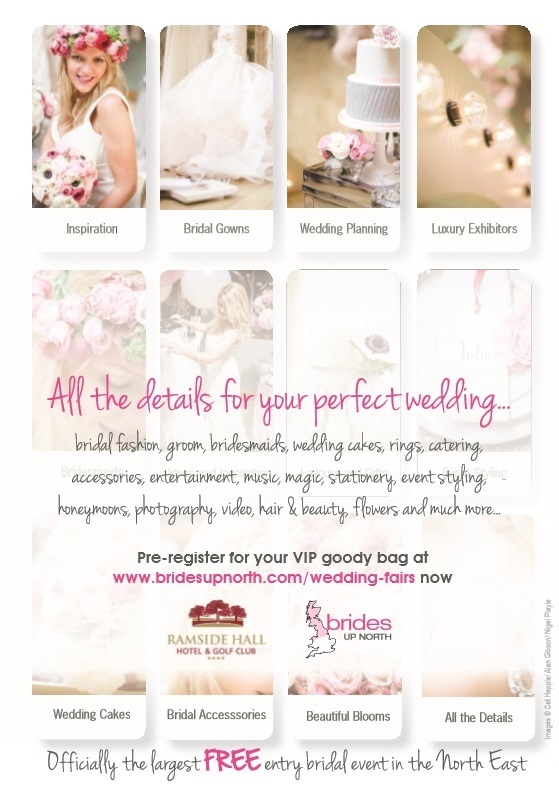 We would love to welcome new exhibitors to the Brides Up North family in 2014. We are now accepting exhibitor bookings for all of our fabulous luxury wedding exhibitions across three regions this autumn. Contact us. Exhibitors will be strictly limited by category and places will be allocated on a first come, first served basis. Since their inception in spring 2012, all exhibitions have been sell outs on exhibitor space with a record attendance for every venue. Consequently, we expect demand for our autumn season to be very high. Get in touch as soon as possible to guarantee your place.